One of his most urgent pleas was for the U.S. States to resist the temptation to impose local content rules, because international collaboration was what made the industry grow in Europe in rapid time. Dickson pointed to the example of the North Seas Energy Cooperation, an initiative which aims to establish an offshore grid linking the ten countries in the North Seas region (Belgium, Denmark, France, Germany, Ireland, Luxembourg, the Netherlands, Norway, Sweden and the United Kingdom). The North Seas Energy Cooperation is facilitating the cost-effective deployment of offshore wind while promoting interconnection between the countries in the region. This is exactly the sort of cooperation that will be required between States in the U.S. to unlock the country’s vast offshore wind potential. 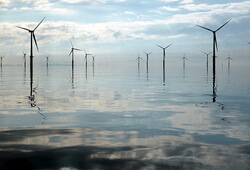 Offshore wind has a proven record of rejuvenating former industrial towns in Europe. Dickson gave the UK example of the Green Port in Hull, where offshore wind has brought €400m in investment and directly created 1,000 new jobs while providing a wide range of social initiatives to the local community. Dickson also set out the current state of the wind industry in Europe: There are now 189 GW of wind energy in Europe, making up 14% of the EU’s power demand. 18.5 GW of this is in Europe’s offshore fleet, whose 105 wind farms and 4,500 turbines now provide 40,000 jobs. These numbers are supposed to grow significantly in the coming years as more and more countries start to develop offshore wind. The Board of Directors has elected Senior Vice President, Business Area Wind at Vattenfall, Gunnar Groebler as the association’s new Chair.